The Coastal Path Gets Published Again! Every now and again I get requests from people or companies who want to use my photos for one project or another. I am chuffed to bits when this happens. I enjoy photography, but I am little more than a point-and-click merchant so such requests do no end of good to my ego! Many months ago I was contacted by a historian, Ron Stilwell, who was writing a book about Thanet and East Kent during World War II. I was happy for him to use my photos for this project and he has very kindly kept me in touch to let me know how the project has progressed. After many months and what is clearly a massive amount of hard work, Ron’s book, The Defence of Thanet and East Kent (1939-1945) has now been published. At 200 pages long, it has 50 glossy pictures and masses of other illustrations, both in black-and-white and colour. It is fully referenced and indexed; I am no historian but Ron’s research is very detailed indeed. His book covers the defence of the area region by region. It deals not only physical fortifications, but also has some particularly interesting pages on various spy operations and the spies themselves (I was quite surprised how many there were – the spies of Thanet seem to have been as voluminous as baby spiders in their nests). It covers Operation Sealion, Hitler’s plan to invade Britain, and considers what may have happened if Operation Sealion had been implemented. As someone who has walked this entire stretch of coast I found the book fascinating. We tend to stick very close to the coastline when we walk; we had no idea about so much of the history of the small strip of land on which we trod. 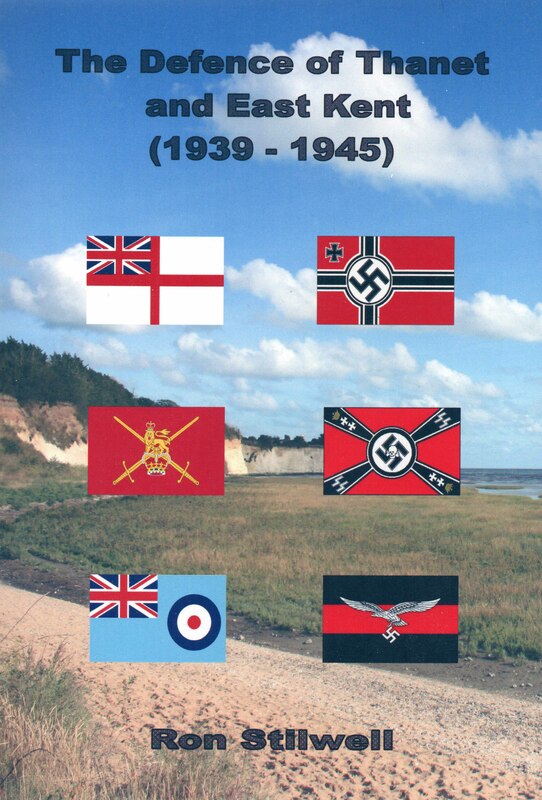 The Defence of Thanet and East Kent (1939-1945) is available at £12.99 plus £2.90 postage and packing by contacting the author, Ron Stilwell, via Facebook. This entry was posted in Miscellaneous and tagged books, Kent, photography, published, Thanet, World War Two. Bookmark the permalink. 7 Responses to The Coastal Path Gets Published Again! How many of your pictures were used in the book? That’s one of yours on the cover, isn’t it? Your family must be so proud! Thanks Jill! You are correct about the cover photo! You clearly have the keen eye of a hawk when it comes to such things! There are three of Nic’s photograph in the book. And very good they are, showing just what I wanted to illustrate. That’s very good, well done. And cover pic too. During your series I’ve been amazed how much ‘war’ you’ve encountered all along the coast, from napoleonic onwards (oh – you must have passed Hastings too!). One comes across remnants on coastal visits but not the linear whole. Do you have a book in mind?????? ps – No, no book in mind! If I can get a few snaps in other peoples’ then I have already surpassed my dreams! I am truly in awe of much of the writing on WordPress; the quality of my own is very poor by comparison and a constant frustration to me! But I am transferring my posts to a Word document and printing them off for my children to wade through at some stage if they ever feel like it.